A huge supply prompts continuing 50% rule and other industry lending standards. Miami’s condo glut is not deterring lenders under the right circumstances, as illustrated by a recent $138 million loan for the luxury condo Elysee in the East Edgewater neighborhood. One continuing common lender requirement: 50% sales. “The 50% deposit structure shows strength for both lenders and buyers. It’s the standard here,” Taylor Collins, managing partner of Two Roads Development, tells GlobeSt.com. Two Roads finalized the loan for the 57-story, 110-unit Elysee condo project last week with JP Morgan Chase prevailing over five bidders. The deal marks Miami’s largest condo construction loan of the year, and the first $100 million+ loan to close in Miami’s urban core dating back nearly 18 months, according to the company. South Florida’s 50% condo requirement is more like 30% in other Florida areas, Collins says. Collins sees no slowdown in the area’s condo market. But there has been a change from 70 to 80% foreign buyers to a mix closer to 50-50 as more US residents enter the market. That is no surprise because New Yorkers and others who came mainly for the weather are also becoming buyers for other reasons. “Miami is still a tremendous bargain compared to LA or New York, sometimes 50% less. So that’s one reason but so is the better tax treatment here,” Collins says. Priced from about $1.5 million to upwards of $10 million, Elysee’s half-floor and full-floor units range from three- to five-bedroom layouts. Their sizes are between 2,300 and 4,000 square feet. 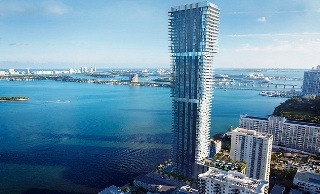 Designed by world-renowned architect Bernardo Fort-Brescia of Arquitectonica, Elysee is located along Biscayne Bay at 788 NE 23rd St. It is being developed by Two Roads in partnership with entities managed by New York-investment firm DW Partners.